Box of 36 premium quality min-bakhoors (3gm each). Individual packaged like luxurious chocolates inside a beautiful golden, ornamental box. Give as gift to someone special or for your personal pleasure. 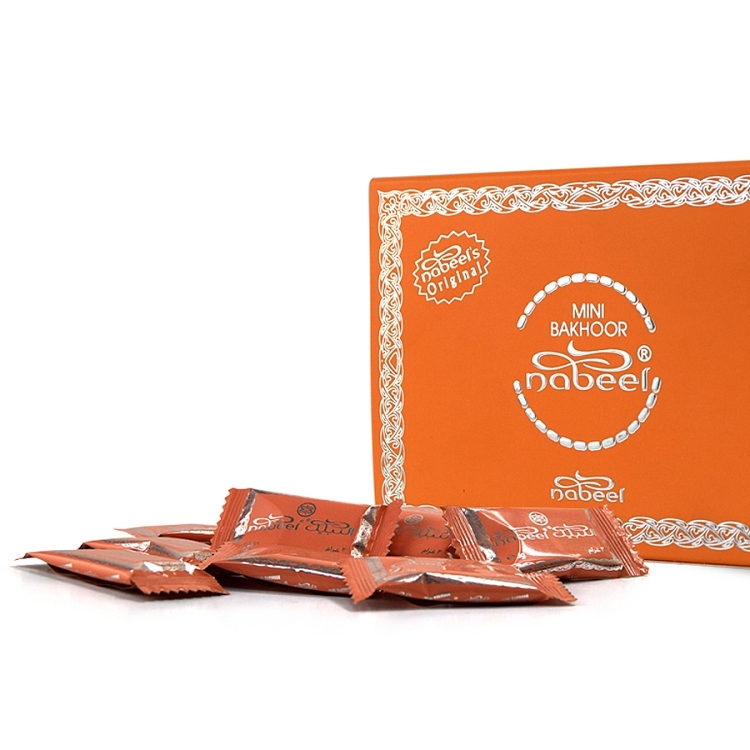 A beautiful smelling popular bakhoor, gentle to burn and slow to release Mini Bakhoor Nabeel (formerly Touch Me). Direction: Take a piece of incense burning charcoal and heat a corner of it with a small flame (lighter/cooker) for about 60 seconds until it becomes red hot. Place the piece of coal in incense burner. Sprinkle small amount of Bakhoor Incense. You may also sprinkle the incense directly on an electric burner. Bukhoor or Bakhoor is the Arabic name given to scented bricks or a blend of natural traditional ingredients, mainly woodchips (Oudh the Arabic name for Agarwood/Aloeswood) soaked in fragrant oils and mixed with other natural ingredients (resin, ambergris, musk, sandalwood, essential oils and others). These scented chips/bricks are burned in charcoal or incense burners to perfume the house and clothing with the fragrance rich thick smoke. This is used specifically on special occasions like weddings or on relaxing times or generally just to perfume the house or store. It is traditional in many Arab countries to pass Bukhoor amongst the guests in the Majlis (Arabic meaning sitting room) this is done as a gesture of hospitality.